Bat Sleeve Fur Collar Shawl Sweater Cardigan Jacket, made of cotton, knit fabric, in cream color. Bat sleeve Fashion on the Cardigan Jacket, personality, casual Fashion. Drawstring twist design on the back, with a Bowknot on the end, so unique! Fur collar, gorgeous, warm and soft, best for chilly winter. 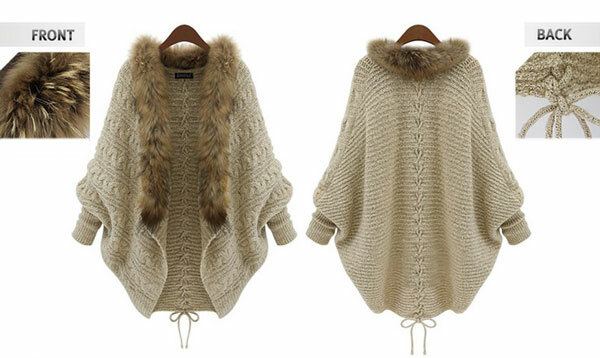 With this Bat Sleeve Fur Collar Shawl Sweater Cardigan Jacket, you will be leading New.